The CDC is seeking artists of all ages, students are welcome to apply as well, to help trace a second major mural onto the side of the recently renovated Bank Square Building in Lexington Park. The mural is being produced with support from the CDC, St. Mary’s County Arts Council and State Farm Insurance – Phil Riehl, and WorkSpace, a recently renovated series of furnished offices with shared conference and lobby space overlooking Gate 2 of the Patuxent River Naval Air Station. 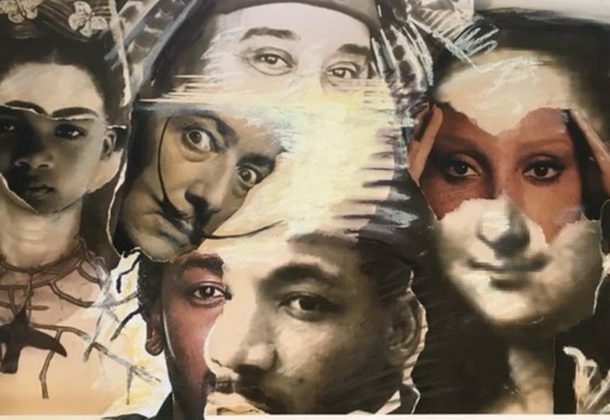 “Artist Rainbow,” a collage with many famous faces such as well-known artists, speakers, and poets, will peek out at Great Mills Road, from the back wall of Work Space. Most images will be slightly altered, but remain recognizable, showing that artists know no cultural barriers. A design by Lyn Wescoe was installed in this manner in 2017 on the other end of the Bank Square Building at 46940 South Shangri-La Drive, where it can be seen from Great Mills Road and South Shangri-La Drive. Ms. Racanello will also be installing this second mural. A glimpse of “Artist Rainbow” will also be visible from Great Mills Road, to inbound Lexington Park traffic just past the furniture store down the “Wings” art alley. The CDC needs artists to help trace the projected mural onto the side of the building. This will occur at night, probably in May, to allow for the projection to show. Once scaffolding is in place, a handful of artists with steady hands will trace the outline of the mural. There are small stipends available for the tracing team members commensurate with experience, in large part from St. Mary’s County Arts Council. For the CDC to match grant funds contributions and sponsorships will be sought. Questions about the mural can be sent to execdirector@stmaryscdc.org or rjernigangoldberg@smcm.edu. To leave a voice mail, call 301-863-7700. St. Mary’s County Community Development Corporation is a nonprofit that leverages government funds, donations, and private capital to build infrastructure and encourages projects that boost economic development.